On request, we also offer online courses! First and foremost, children will learn the playful interaction with Structuristic painting Techniques. Especially during this phase of their development they need special attention, which is warranted to be given to them as a result of this sensitive art style. Only in the online classroom it needs for this age group from time to time the support of an adult person. During puberty teenagers frequently go through periods of insecurities as well as emotional ups and downs. The stabilizing concentration on works of art they have created with their own hands boosts their self-confidence while it fosters the constructive exchange with others at the same time. Thanks to the progressive educational methods, adults have the opportunity to establish their own businesses as Structuristic Artists or to become instructors if they have an interest in a teaching career. Another option is to simply learn the technical fundamentals required to make this wonderful painting method a satisfying leisure time activity. The tuition includes the gloss coating of the paintings, which will be registered and the presentation of the artwork in the online gallery anonymously. The Art Center issues subscriptions of 6 lessons at a time, for which advance payment via bank transfer or cash payment is required. 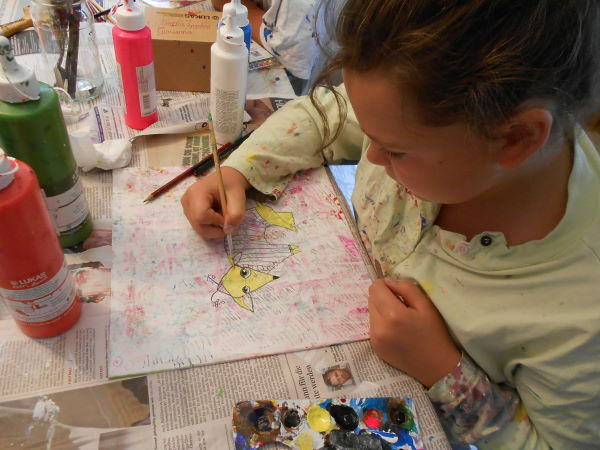 The first subscription of 6 lessons at a time includes the cost of materials afterwards all participants are obliged to purchase an own painting set. Families can use 1 set for up to three persons. Deferred payments for painting sets are possible, if needed. By arrangement between teacher and student. The lessons will be held by arrangement between teacher and student, registration is required. Application: Application is required and it is binding contracts. Children and adolescents will require the signature of their legal guardians to register. Excused absences: If a registered student is unable to attend a scheduled lesson, 24-hour advance cancellations are required. Failure to cancel or late cancellations will result in the student being charged the full tuition for the lesson missed. Structuristic paintings: Title to started and finished paintings not picked upon completion of the course and one year thereafter shall transfer to the art academy. Registration: Each picture can be registered on a voluntary basis for a small fee as long as the Structuristic criteria of craftsmanship have to be fulfilled. The fee includes also the presentation of the artwork in the online gallery anonymously. As a result, artists and their work become official members of the community of Structuristic artists. Only pictures which are registered by the Structuristic Art Centre in Hamburg are considered to be official Structuristic paintings. Terminations of the education: Terminations may be submitted at any time but must be submitted in writing. Course fees that have been paid in advance shall not be reimbursed but may be transferred to different or new participants. Subscriptions: All subscriptions shall be valid for one year. It is not possible to renew expired subscriptions. Insurance coverage: Participants shall be required to obtain their own mandatory accident and liability insurance coverage. The Art Center shall not assume any liability. This shall also apply to personal painting outfits or other materials left in the custody of the academy. 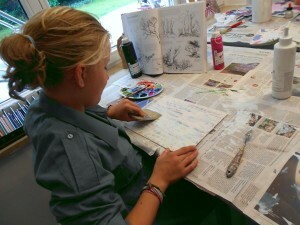 Clothing: Participants are required to wear comfortable clothing that is suitable for painting. It is also recommended that children additionally wear aprons.